These two twins have a special connection. 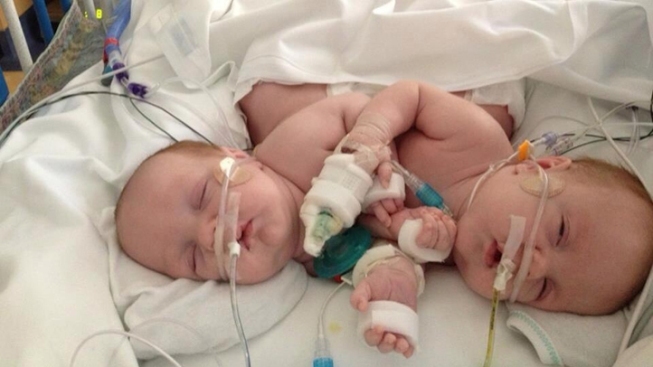 Owen and Emmett Ezell, born conjoined on July 17 and connected from the chest to the belly button, shared a liver and intestines. On Saturday, the boys underwent a successful separation surgery in Dallas that lasted almost six hours. The twins were still in intensive care at Medical City Children’s Hospital on Wednesday, but they’re recovering in their own beds. "It's wonderful for us to be able to sit here and think about, 'How are we going to bring these two boys home? What are they going to be like?" said their father, Dave Ezell, who spoke to NBC DFW via phone from the hospital. "They're starting to open their little eyes, and they're starting to wiggle their little fingers," he said. "You can see that recognition in their face. It's truly heartwarming." The family has kept family, friends and even strangers up to date on the pregnancy, birth and surgery through a blog and Facebook page. They’re now starting to write about the boys’ recovery. On the pages, readers offer up encouragement and prayers. The Ezell family said it will gladly take all the support it can get.